Ned, the bullied outsider, and Conor, the new boy and star athlete, are to room together at their boarding school. The boys take an instant dislike to each other, and seem destined to remain enemies until an English teacher, Mr. Sherry, begins to drill into them the value of finding one's own voice. However, this lesson isn't appreciated by everyone, particularly rugby coach Pascal, who has his own agenda - and who harbors some deep suspicions about the boys' teacher. A funny and observant coming-of-age tale from Irish novelist and filmmaker John Butler. It's nice to see a new gay movie come out of Ireland (it's still kind of rare). Handsome Devil offers a touching reminder of the importance of loyalty, bravery, standing up for yourself and making sure that your voice, no matter how different, is heard. Lead actors Fionn O'Shea and Nicholas Galitzine give exceptional performances as two young men discovering who they really are and what they really want from life. You won't be able to walk away from this movie without feeling touched. A nicely acted story, but so, so vanilla Gay. They ended the story with a "hug", but no touching or kissing. After watching SKAM, the Norwegian TV soapopera, this movie was a letdown production. I suspect that the Irish Film Board may be suppressing explicit homosexual content. Ned and Conor are to share a bedroom at their boarding school. The loner and the star athlete at this rugby-mad school have an unlikely friendship that is tested by the authorities. What we see here is not new- "the geek pariah and the secret gay jock" along with the inspirational teacher are familiar topics. It is the sweetness, poignancy and humor of this Irish story that makes it irresistible. Fionn O'Shea and Nicholas Galitzine are the friends and they turn in terrific performances as does Andrew Scott as the teacher, a man who practices what he preaches and steps out of the shadows. Unable to convince his widowed father (Ardel O'Hanlon) and chilly stepmother (Amy Huberman) that a boarding school where rugby is a religion is the wrong place for him, Ned Roche (O'Shea) prepares himself for another term of ridicule and teasing from his "tormentor in chief," Weasel (Ruairi O'Connor). Ned is a thin, self-styled 16-year-old rebel with over-dyed red hair and a room decorated with David Bowie lyrics and Dita Von Teese pinups. His solitary nature and ambiguous sexuality make him a target for gay slurs from his classmates. Then when transfer student Conor (Galitzine) is assigned as his new roommate, the mismatch could signal extreme discomfort. Conor is a hunk with a stellar record on the rugby field. We learn that he did not exactly leave his previous school because he wanted to. Ned senses that there will be trouble so he erects a "Berlin Wall" down the middle of the room and tries to keep to himself. But Conor has his own issues causing him to feel alone in the flock, and his shy efforts to reach out allow Ned to find an unaccustomed taste of friendship and acceptance. Dan Sherry (Scott), their English teacher has no tolerance for laziness or stupidity. He sees the potential in both Ned and Conor and encourages their friendship and their musical interests, signing them up against their better judgment to participate in a talent show at a neighboring girls' school. However, rugby coach Pascal O'Keeffe (Moe Dunford), resents the distraction from Conor's game as the school team approaches its first final match in some ten years. He creates dissent between the friends that lands Ned back in social exile, gets Conor ostracized and puts Dan on the spot about his own secrets. We can anticipate where this is going but that does not hurt the film. It is set almost entirely at an all-boys boarding school and details the unlikely friendship that forms between Ned and Conor. 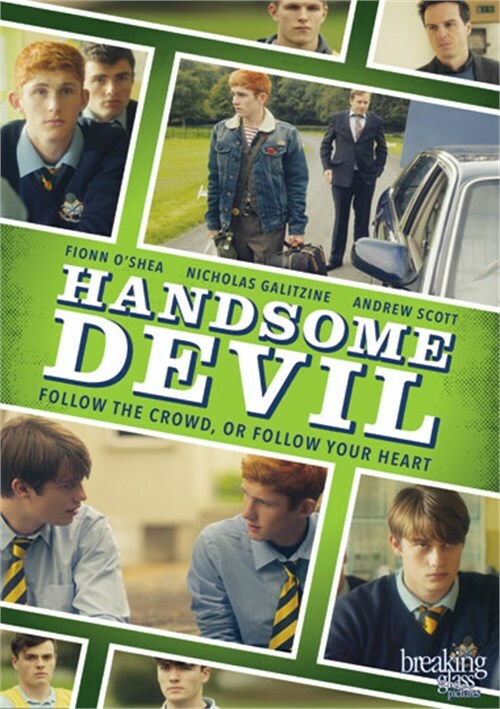 The quest of being true to yourself very evident in "Handsome Devil", a charming coming of age/coming out film from writer/director John Butler. The two total opposites clash right from the offset. but as time progresses, and with a little help from supportive English teacher Mr. Sherry, the two students realize they have a little more in common than they had envisaged yet they felt that their friendship boosts Ned's reputation at school but has the potential to truly destroy Conor's. The friendship between the protagonists does feel somewhat hurried, but there is chemistry that allows for the viewer to become involved in their solidarity. You do not want to miss this film.